Did you have a nice weekend? Our was both constructive and fun filled which is always good. We had a lovely time down on the farm yesterday. Well I say farm, there were a few animals but it was more about sandpits, trampolines and soft play! This was followed by a very spontaneous meal out at Chiquito. We had a such a good meal and the kids loved it too. It is now a family favourite. Also this weekend we finished painting the downstairs bathroom (and by that I mean my husband did) and I went declutting crazy. One day this house WILL be tidy. And the final brilliant thing aboutt this weekend was that I managed to bring my tulips back to life. They were looking all droopy like this but a top up of water and by the morning they were all perky again. 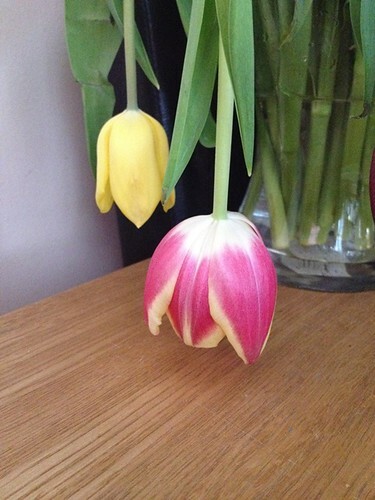 Another reason to love tulips!